Kingston University faces three years of potential turmoil after launching a controversial plan to transform its reputation and performance. The scheme, called Plan 2020, will aim to improve the quality of teaching, streamline the courses that it offers and dramatically boost the university’s reputation. But a traumatic series of changes will see massive restructuring of departments, axing of poorly performing courses, cutting of all half fields and significant job losses. 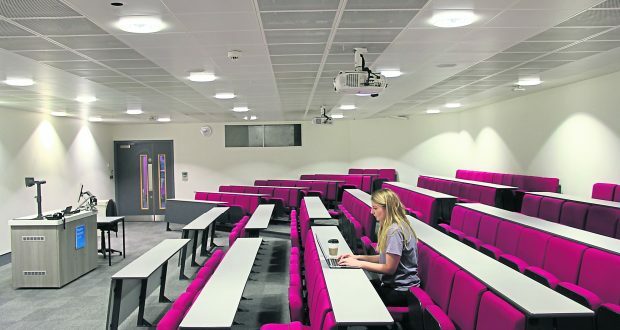 It comes as the University faces a significant deficit in its income running into tens of millions of pounds as the number of students enrolling over the past eight years has slumped by 40 per cent. The University has also sunk in key rankings, with over half of KU subjects struggling in the bottom 25 per cent of national league tables. Acting vice chancellor Steven Spier said in an email to staff: “Our overall academic standing is now affecting even those parts of the university that perform well. “These harsh realities mean that we have no choice but to act at pace to ensure the University’s long-term sustainability. “Beyond that, we need to become a far more agile and dynamic institution, able to hold our own in a highly competitive marketplace. Among the most dramatic plans are the closures of several departments including geology, human geography and applied economics – although some aspects of these modules will be absorbed into other courses in order to create new options. Music, politics and economics courses also face major reconstruction that the senior management team believe will make Kingston appear more attractive to prospective students. Engineering, computing and maths will face a major review in the summer with staff fearing major cuts may be on the cards. The future of the Roehampton Vale campus has also been discussed. Which of Kingston’s courses are at risk? The University is also set to cut back on staff numbers, with restructured departments facing significant losses and voluntary severance or voluntary early pension deals being offered to a large number of permanent staff. However, compulsory redundancies have also been discussed if not enough staff leave voluntarily. The proposed plan, which is now open to consultation, shows that the music department will lose six full-time staff posts, economics will lose 6.7 and politics will lose four. A source revealed to The River that they expect at least 100 staff to go before the start of the next academic year. Some of the lecturers hoping to remain will “compete” for limited positions within Plan 2020’s ring-fence policy. But the university stated it “reserves the right to recruit externally, either from across the wider university or from outside the organisation”. The University’s figures reveal that full-time students have declined over the last few years. There were 25,430 students including postgraduates enrolled in 2010/2011. This academic year it is thought that number has dropped to around 17,000 while the university predicts it will fall to 15,000 next year. As The River revealed last month, 71 half-field courses will be cut from KU in the next academic year due to lack of recruitment. Recruitment to all half-field courses will be stopped in 2018, although some half-fields will become proper combined degrees. Music is facing a complete overhaul. Previously, prospective students could choose from a degree in music or creative music technologies. Now, new students will now have the option of music technology or popular music. Higginbottom said: “The expertise of staff is being ignored; music recommendations were based on one external anonymous consultant’s report. Economics is also facing change, with applied economics closing completely due to “low levels of student progression and achievement, and declining student numbers,” according to Plan 2020 documents. Politics is currently sitting at the very bottom of the league table, so it is of no great surprise that its viability is being questioned. 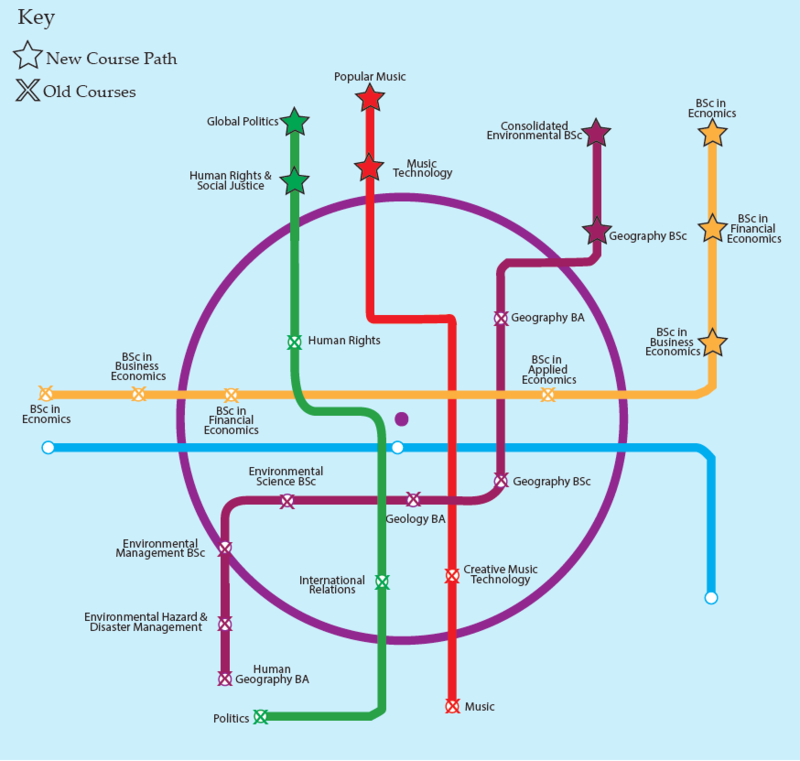 The courses will be condensed from politics, international relations and human rights into two new courses – human rights and social justice and global politics. “The politics department did have a say in creating human rights and social justice, which we think will be an attractive degree,” said Higginbottom, who also lectures in politics. According to the acting vice chancellor, Kingston’s poor reputation is also impacting the “calibre” of students enrolling. It was implied in the plan that some students did not have the necessary academic skills to reach their full potential in their degree. “We can expect more from Spier about becoming an ‘agile and dynamic institution’. “To translate this favourite business phrase, it means cutting out parts of a company that don’t generate profits in current markets and adding them back in when things change. Professor Vesna Brujic-Okretic, head of computing and information systems, said she felt 2020 was “necessary” and that the whole university should embrace it. She said the plan was in line with what her department was intending. Professor Brujic-Okretic said that in order to be a successful lecturer, staff needed to embrace change and keep up with modern technology. She said: “Nowhere in this environment or sector can you survive or thrive without that attitude. This phase is already underway and action is being taken where KU thinks it is most ‘urgent’, however courses to be cut will be ‘taught out’ so current students will not be affected. Some courses will be restructured within: FASS: Music, Politics, Economics and SEC: Geology, Geography and Environmental subjects. A 45-day consultation will begin in late February. It is proposed that Film courses will move from FASS to FADA and Law courses from the Faculty of Business and Law to FASS. In late summer 2017, Kingston will review SEC subjects: Computing, Mathematics and Engineering. A Kingston University spokeswoman said: “All courses will be continuing as usual during this period and the University remains committed to making sure its students get the very most out of their time on campus. “It will also be taking in new students for the same courses next year. They will complete their full degree programmes at Kingston University. Phase one of 2020 is already underway and causing uncertainty amongst staff and students, phase two is a 45 day consultation period which will begin in late February, phase three is anticipated to start in late summer 2017. Kingston’s University and College Union will be co-organising an event with Kingston’s Student Union on February 22 about Plan 2020, all are invited to attend and information regarding this event will be released shortly. Tessa is a News Editor for The River and is currently studying a bachelors degree in Journalism with Human Rights at Kingston University. She has previously worked for the Newsquest Media Group, Pollstation opinion sharing network and with the social impact charity Be Enriched. Music has a number of lecturers unable to communicate with students on the level that interests them and/or on which they understand. To be specific, these problematic lecturers are not well-versed in popular music idioms, and cannot teach essential musical concepts across genres. The kind of lecturers that students want and need are those with a highly rigorous background in traditional “classical” music, but who have also personally worked in other more contemporary popular musical traditions. Some of the current lecturers, who possess the requisite popular music experience lack the rigorous training needed to convey key musical concepts at the level of depth needed to educate well-rounded aspiring professionals. While those with rigorous training in classical music, know little about the way in which popular music employs many of the same techniques and materials. In other words, students and their lecturers need to know about classical music as well as popular music, as both employ many of the same underlying musical concepts. This has been the tension within the Department for the better part of 15 years or so. It is important to note that dropping student numbers was a deliberate policy of the previous Vice Chancellor Wienberg. It seems absurd therefore that the senior management team are disturbed by this and blame teaching staff! Despite the drop in student numbers, Kingston still has one of the worst staff student ratios, not just in the UK, but in Europe, with 1 staff member for every 19.6 students. The explicitly stated aim of the senior management team is to make that ratio worse, 1:20, through PLAN2020. How they believe that will improve the student experience is beyond comprehension. Completely agree with your assessment, JP. I don’t disagree with Weinberg’s policy of dropping student numbers, with its intended goal of improving the quality of the student body by making it harder to gain entry, and improving the student experience by improving the staff to student ratio. The problem now is that the middle and upper administration is so bloated that it can’t sustain the lowered revenue stream. So instead of cutting administrative fat, they bash lecturers and cut their ranks. Can you imagine management cutting its own ranks? I can’t either. One accredited degree in Sec will, as a result of plan 2020 and years of refusing to replace staff who leave, have 1 qualified in-house staff member to teach the whole of 2nd and 3rd year from September. There are about 40 students per year on this accredited degree. This was made known to the senior management team and their response was that this was a good reason why we shouldn’t offer the degree in the first place. They disgust me utterly. The same degree currently has one member of staff appointed to a short contract, who has been teaching since January with no contract preared or signed and no pay.